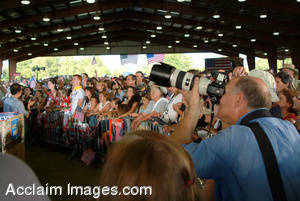 Description: Stock Photo of a Photographer in a Crowd of Supporters for John Kerry. A politcal rally for John Kerry, a 2004 presidential candidate, held in Southern Oregon on August 12, 2004 shows some of the people and camera men who voted for him. You may purchased this photo as an art print or poster. It is also available to license as stock photography.